David B. Williams discusses Seattle’s surprising geological history. The marled stone behind him is 3.54 billion-year-old gneiss that can be found at the base of the Seattle Exchange Building. In the past week, Seattle received more bad news about its ill-fated tunnel construction and Bertha, the infamous tunnel-borer that has now been stuck under the city for a year. New reports indicate that Pioneer Square has sunk an inch since Thanksgiving and that a number of historic buildings and roadways are newly compromised by the beleaguered tunnel project. In this guest post, author David B. Williams places these recent developments within the city’s complicated history of reshaping its landscape, arguing that the shifting ground should come as no surprise. Another day, another problem with Bertha. This time it has to do with cracks and settling and groundwater and planning and fixing and… It’s amazing how many problems that Bertha has had! I want to focus in on the newest map released by the Washington state Department of Transportation (WSDOT). Below is a zoom-in on the map, where I have added an outline of Seattle’s historic shoreline in red. 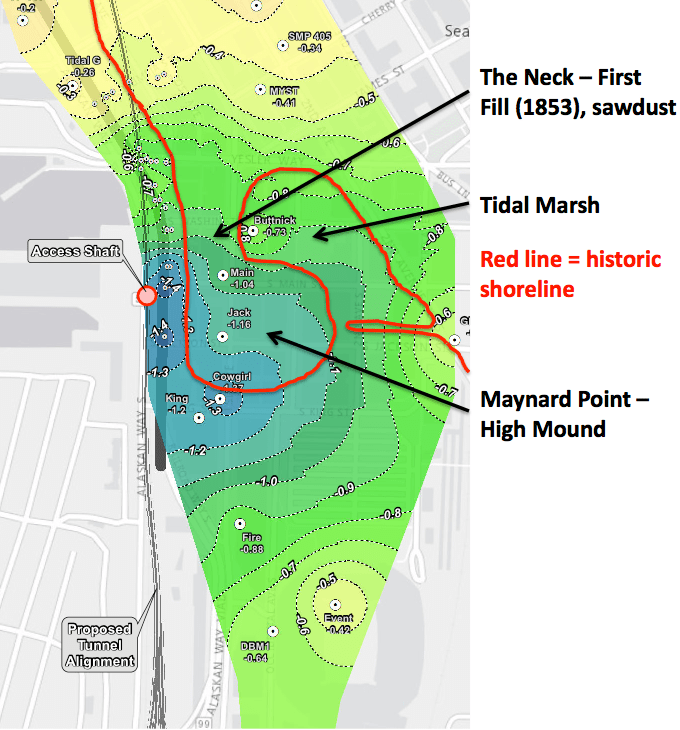 You can clearly see that the areas of greatest settling correspond to where the city was filled in around what is known as Maynard Point (also known as Denny’s Island, but this is a made up name that probably didn’t come into existence till the 1960s). Maynard Point was a mound that rose perhaps 20 feet or so above sea level. It connected to the main part of Seattle by The Neck, a low spot that would periodically be covered by tides, converting the mound into an island. The Point has also been buried by fill. Ever since WSDOT released information last week about their groundwater problems, people have been in a tizzy about the ground settling. Pioneer Square has had groundwater and settling problems for decades. Why do you think the sidewalks tilt? They weren’t built that way. Why do think so many buildings have steel retaining rods sticking out of them? It’s because the ground is settling. Why do buildings have sump pumps, which are needed more often in the winter during high tides? The Seawall doesn’t stop the tide; it’s not supposed to either. Why do parking lots undulate? Cores show that under the surface is a stew of crap, including coal, lumber, pilings, wood debris, sawdust, ceramics, sand, boulders, charcoal, ash, bricks, metal, glass, that continues to decay, compress, and settle. Walk along Western Avenue between Yesler and Columbia and you’ll see what looks to be an engineer’s nightmare. The middle of the street is higher than the sides and the entire road surface undulates. The concrete curbs also look as if they had been poured by a drunkard, sometimes disappearing under the street and sometimes rising eight to ten inches above it. Near the southern end of the street is a low point that every time I have walked by is a pool of water. Ask any building owner or tenant in the area and I suspect they will be able to tell you additional stories of how their building is anything but immobile. I am not writing this to defend WSDOT, but no one should be surprised by ground surface and subsurface issues in this area. It certainly looks like Bertha has contributed to the problem but it does not bear sole responsibility. These problems are the legacy of the landscape where we live and that we have altered continuously since first settlement, and there appears no end in sight to this constant state of alteration and settling. David Williams‘ forthcoming book, Too High and Too Steep: Reshaping Seattle Topography, uncovers the fascinating history of Seattle’s manufactured topography and is due out in fall 2015. 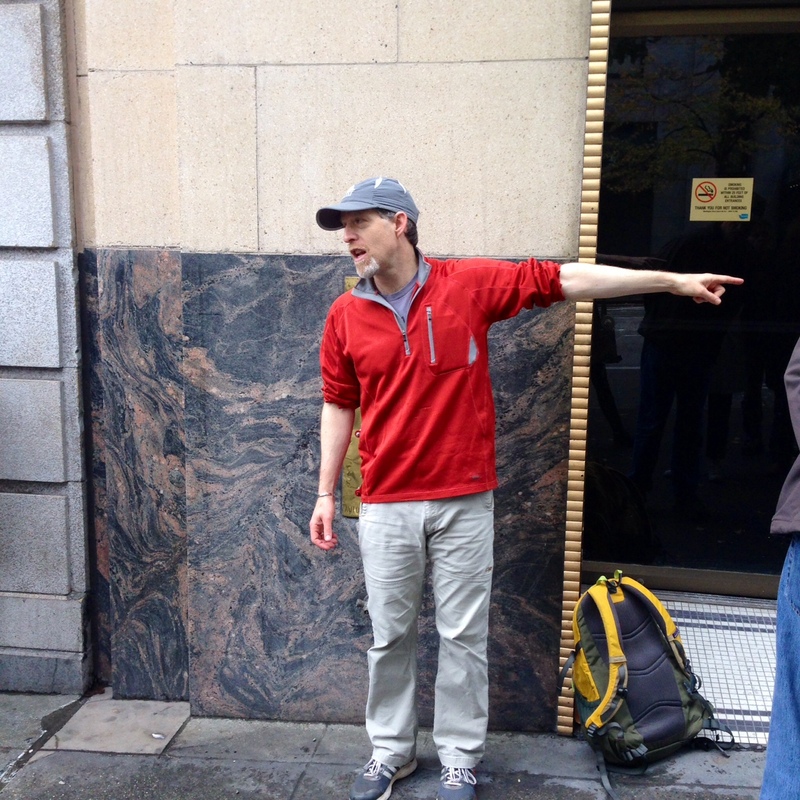 In the meantime, stay tuned to David’s timely research: follow his blog, attend his upcoming talk at MOHAI, or join him for a walking tour of downtown Seattle’s geological history. This entry was posted in Guest Post, History, Pacific Northwest on December 17, 2014 by uwpressblog. I’m in print! Sort of! My name mostly is!